Situated in the protected green area of Elviria and within the exclusive Four Star Alanda Club Marbella resort. Just 5 minutes walk takes you down to one of the finest sandy beaches on the Marbella coastline with a choice of excellent beach restaurants, bars and cafes. Surrounded by 35 golf courses and close to tennis clubs and many water sport activities. Spanish style open plan apartment with lift access to assigned underground car parking. Large south facing balcony offers year round sun and spectacular views of the sea and mountains. Set in lush gardens with several outdoor pools and Jacuzzi. Flat screen TV in lounge and master bedroom. Free Wi-Fi. Internet room and games room in clubhouse. Children's Club, babysitting, indoor and outdoor children's play areas. Room service, alarm, safe and 24 hour English speaking reception. Use of heated indoor pool, gym, sauna, snooker and tennis tables, squash court and golf desk. Spacious en-suite bathroom to bedroom 1 with separate bath, shower, wc, bidet, hair dryer, bathrobes. En-suite shower room to bedroom 2, wc, hair dryer bathrobes. Shower room off lounge with wc, hairdryer. Lounge with south facing balcony. Views to the sea. Large flat screen satellite TV. Dining area, 2 sofas, double sofa bed. Fully equipped with cooker, hob, fridge, freezer, dishwasher, microwave, coffee maker, juicer, breakfast bar. It is possible to go skiing for the day to Pradollano in the Sierra Nevada mountain range. The resort is a near Granada and about 2 hours drive away. Alanda Club Resort is surrounded by over 35 golf courses. So much choice can be a little overwhelming so the dedicated golf desk at the clubhouse reception is on hand to make your bookings and advise you on which courses will best suit your skill level and tastes. They can offer many special discounted rates on bookings. Golf club hire, is also available at the desk. The nearest golf courses are Santa Maria, Rio Real, Mijas and La Cala. Notes on accommodation: Use of Alanda Club facilities including snooker tables, internet and business centre, table tennis and children's games room. Golf and tennis can be booked at reception. Evening entertainment programme and the fully supervised children's club during high season. Free Wi-Fi. Outside: An attractive aspect of the Alanda Club Resort are it's private lush and beautifully manicured gardens. There's a choice of several outdoor pools and jacuzzis for use in the Resort, which means it's always easy to find a relaxing spot to lounge and enjoy the beautiful surroundings. There's also a Children's playground situated at the clubhouse. Utility Room: Washing machine, tumble dryer, clothes airer, iron, ironing board. Cleaning / Towels / Linen / Maid service optional. Linen and towels provided. Beach towels which are provided. This is an all year round resort and is an excellent base for golf, watersports, tennis, skiing, etc. The beautiful golden sandy beaches stretch for miles in either direction and are great for walking. Andalusia has a rich and varied history and this is reflected in its many ancient towns. Information on all of these activities and tours to the many beautiful places of interest the region has to offer can be obtained at the reception desk. Only 5 minutes walk brings you down to the beautiful safe golden sandy beach of Elviria which stretches for miles in either direction. The beach has a great choice of excellent beach restaurants, such as El Laurel, Tony's, Christinas, La Papillon to name a few. The famous Nikki beach club at the five star Don Carlos Resort is a nearby and is great for lunch, lounging and people watching. Nearest airport is Malaga ( approximately 40 minutes drive away). Taxis to the apartment cost approximately 60 euros from here. A train service runs from Malaga Airport to Fuengirola every 30 minutes. The train fare is 3 euros per person and a taxi journey from Fuengirola to the apartment costs around 30 euros. 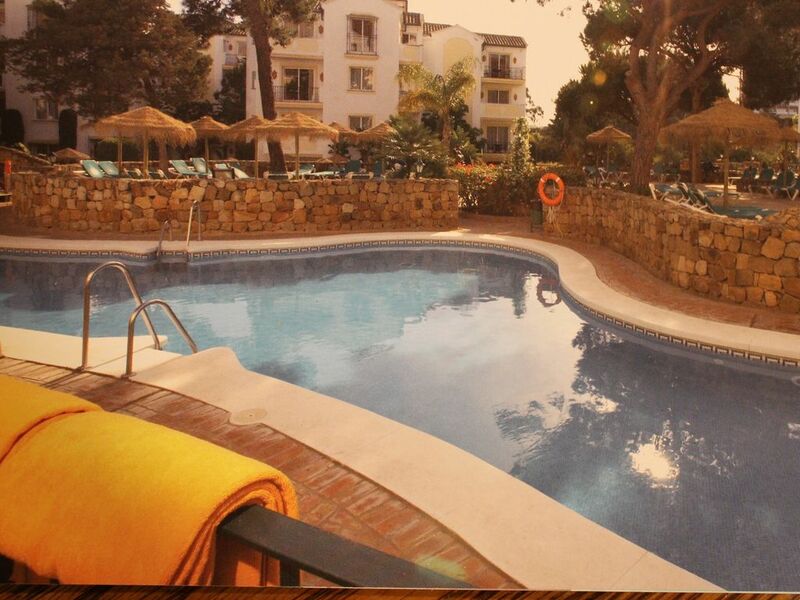 The resort is a short walking distance to the shopping and entertainment centre of Elviria. Marbella town is a 10 minute drive. Puerto Banus is about 20 minutes away. There are restaurants to suit every taste, bars, cafes, supermarkets, pharmacies, banks etc. within walking distance. The new and inviting Irish 'Playwright' restaurant is situated about ten mins walk inland. Booking Notes: 25% of total rental fee is due on reservation, with the balance payable 8 weeks before arrival. There is a separate refundable deposit of £200 required against loss or damage in the apartment. Rental prices for additional nights can be agreed with the owner. Please call to inquire about possible late availability rates. Changeover Day: Changeover day is flexible. Checkout at 10.30 and checkin at 4.30 approx.